Dimensions: 6 1/2 x 8 in. 24 pages. Comes with sound module! For all Ages. Hardcover. 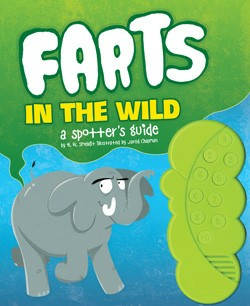 From tiny bubble-popping goldfish toots to thunderously loud elephant gas, learn how to spot the funniest (and smelliest) farts in the animal kingdom! Hilarious tidbits identify the odor, range, frequency, and aftereffects of ten different types of gassy expulsions, while the attached battery-powered fart machine reproduces each emanation with astounding accuracy. This is pure, unbridled entertainment for the giggling child in all of us. Let ’er rip!